In May, 1984, with no explanation, Spider-Man started wearing a black costume. The romance between Colossus and Kitty Pryde ended suddenly. 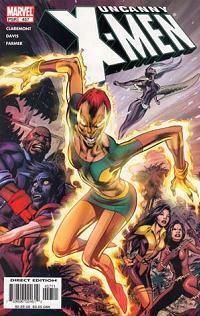 The Thing was missing in action, and She-Hulk had taken his place in the Fantastic Four. It took a year of wondering and twelve issues of Secret Wars before fans finally understood why the characters they were reading about went through such drastic changes so quickly. 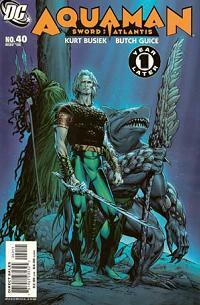 Now, more than twenty years later, DC is about to do the same to their characters, only on a much grander scale. Starting tomorrow, March 1, every ongoing superhero title in the DC Universe will leap forward One Year Later. And I couldn’t be more excited. Of course, this isn’t the first time in recent memory a group of characters has jumped forward a significant amount of time with little explanation of how that time was spent. Several years ago, the X-Men books skipped six months in an “event” that marked the debut of a new Thunderbird, Rogue and Colossus kissing in space, and not much else worth remembering. A few years later, after Xorn was revealed to be Magneto in disguise (sort of), the X-titles jumped forward another six months. 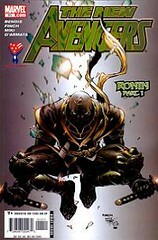 The Avengers skipped over the six months during which they had disbanded after Avengers: Disassembled. Excalibur jumped forward six months in the middle of an issue less than year ago. She-Hulk missed six months comic time while her book was on hiatus for six months real time. So what makes One Year Later special? Well for starters, every current-continuity DC Universe title is making the jump (or getting cancelled). It’s not just the JSA, or just the Batman titles, or just the titles featuring characters heavily involved in Infinite Crisis; every single title skips ahead. It puts new readers on the same level as old ones. No one, no matter which titles they read or how long they’ve read them, will know anything more about the lost year than anyone else. And then there are the great new creative teams. 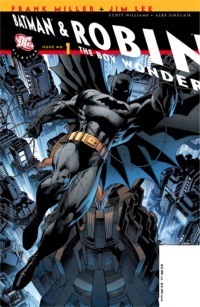 Paul Dini, co-creator of the single greatest modern representation of Batman in any medium, will take on Batman alongside uber-scribe Grant Morrison. Kurt Busiek, one of the greatest superhero comic writers of our time, tackles Superman with Geoff Johns. Alan Heinberg and Terry Dodson do Wonder Woman. 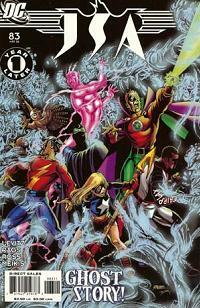 Brad Meltzer writes the Justice League. But most importantly, something actually happens during the year the DC Universe skips. When She-Hulk jumped forward, she spent the time in Wyoming. When the X-Men reloaded, all they did was rebuild the school. And when the Avengers disassembled, they all sat at home in there underwear eating nachos and learning how to be poorly written (or so I like to think). But during the year DC skips, big stuff happens. Stuff so big it warrants an unprecedented 52-issue weekly “real time” comic maxi-series, debuting later this year. We’re going to know the ramifications of the previous year this month (spoilers! two Nightwings, Ravager is a Teen Titan, the Outsiders disbanded, Supergirl and Power Girl are trapped in the bottle city of Kandor, Selina Kyle is pregnant and not Catwoman, Flash, Wonder Woman and Hawkman are MIA), but we won’t know all the whys and hows until May 2007. And who doesn’t love a good mystery? While Jane Foster and Jake Olsen were attending a medical conference in Metropolis, a super-villain attacked. Olsen ducked into a hallway, pounded his fist on the ground and transformed into the Mighty Thor. At the same time, Clark Kent ducked into another hallway and changed into his Superman costume. Thor came out first and dispensed of the villain in no time. Superman came out and assumed that the costumed muscleman in front of him was another super-villain and flew full speed at Thor. To prevent harming the innocent bystanders, Thor hurled Mjolnir upwards, held fast to its strap and was propelled through the roof. Superman followed, using his super-speed to catch up to Thor and land a few strong punches. Thor shrugged them off and twirled Mjolnir overhead to stay aloft. As the two men faced each other, Thor threw his mallet straight at the giant S-shaped target on Superman’s chest. The hammer collided with the Man of Steel before he had a chance to react and pushed him outside of Metropolis’ city limits. 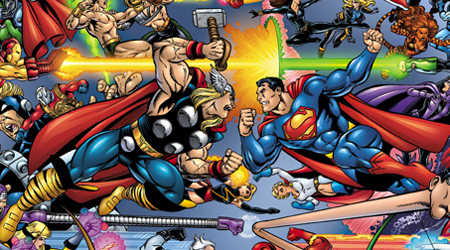 Thor began pummeling Superman with lefts and rights, preventing Supes from standing up or fighting back. Finally, using his super-speed, Superman managed to land a hay-maker on Thor’s chin, sending him flying back. “Your effort tis all for naught!” yelled Thor as he pointed skyward. Superman looked up to see the storm that Thor had called upon while he was beating him. Suddenly, a bolt of lightning shot down from the clouds and connected with Superman. He shrugged it off just in time to notice another bolt course through his body. The onslaught continued for what seems like hours until Superman finally fell to the ground. 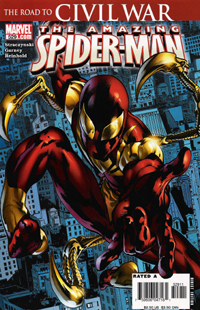 The only thing anyone’s been talking about for the last few months in regards to Spider-Man is the new costume. Most seem to hate it, although Joe Quesada would have you think otherwise. Personally, I’m not fond of it. It seemed like a change made solely to create buzz around Spider-Man, which it’s certainly succeeded in doing. It didn’t even enter into my mind that the new suit could be important to the storyline. Boy, was I wrong. I still don’t like the look of the new suit all that much, but I’m certainly not against the concept of the new suit anymore. While the bulk of the story does center around Peter trying out the new suit, it really doesn’t fell any different that any other Spider-Man story I’ve ever read. Iron Spidey isn’t suddenly a different character (which I’m sure was one of the big fears people had looking at the new design), he’s just the same old Spider-Man in a different suit. It certainly helps that Ron Garney draws Spidey just as sleek as he always was. It’s not bulky armor, and Spider-Man isn’t suddenly a body builder. Garney really draws it more like a red and yellow version of the black costume than a high-tech cybersuit. And thankfully, he doesn’t have those stupid spider legs yet. There are two main reasons I chose Amazing Spider-Man as the Book of the Week. 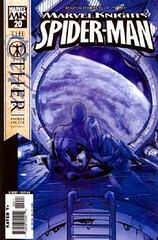 The first is the subplot that J. Michael Stracynski has been developing for quite a while now of the growing relationship between Peter Parker and Tony Stark. The new Spider-suit is just the latest in a long string of things Tony has done for Peter to gain his trust. 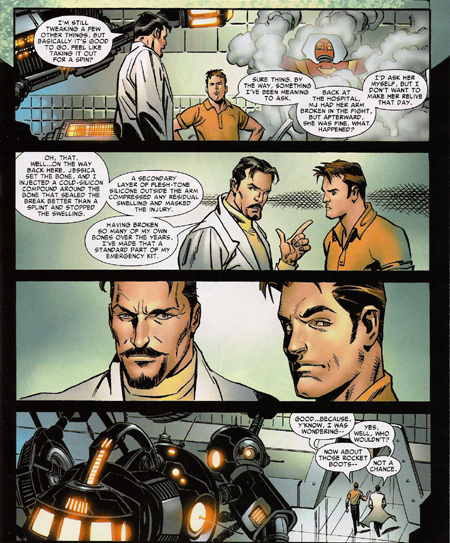 At the end of the issue, Tony convinces Peter to enter into a “blood pact” with each other where they will trust each other above everyone else, including their fellow Avengers. Peter agrees to “stick with [Tony] through what’s coming, no matter what.” And with that, Tony takes out a summons to appear in front of the Senat Metahuman Investigations Committee. The first step on the road to Civil War has been taken, and Spider-Man has pledged to stick beside Iron Man “no matter what.” Now it’s just a matter of time until Spider-Man either does something he regrets to keep his promise or betrays a trusted friend to do what he feels is right. And either way, that’ll be a good story. Never in a million years did I think I’d consider an issue of Ultimate Fantastic Four to be my favorite Ultimate book, let alone my favorite book of the week. Yet here it is. The issue starts with Reed talking to himself, Sue, Johnny and Ben from 24 hours in the future, in the desert right before did the experiment that gave them all powers. The FF from 24 hours later is there to stop the experiment from going forward, and we follow the Reed from now for the remainder of the book and see why the team decides to go back in time to stop the experiment. Johnny’s having a birthday party, and somehow he convinces Ben that it’s a theme party: come as an old movie star, guys go as girls, girls go as guys. Ben shows up dressed as Carmen Miranda and Johnny has a great laugh at Ben’s expense, but Ben runs away in tears. 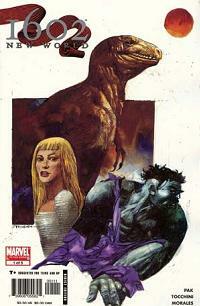 Johnny, Reed and Sue chase him down and Ben tells them all that he can’t stand living as a monster. “I’d slit my wrists if I could find a razor that didn’t break every time I tried.” So the team goes back in time to stop the experiment so Ben can have a normal life. 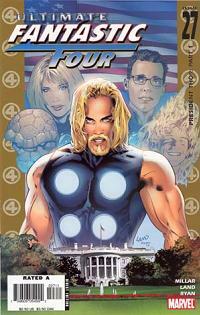 Of course, everything goes wrong and they create a world in which Thor is President and everyone has superpowers. It was really the little things that made this issue great. The acknowledgement that the Skrulls have shown up before in the Ultimate Universe before, and they were called the Chitauri then. Thor as a guest at Johnny’s party. Jean Grey and Kitty Pryde on an expedition with Sue. Little bits like that are what make the Ultimate Universe seem like an actual universe for those of us that love that sort of thing, yet it doesn’t take away from the story if you don’t read Ultimate X-Men or the Ultimates. 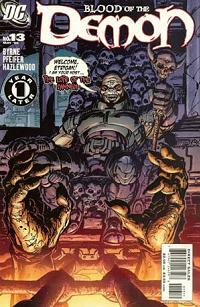 And the subplot with the Fantastic Four zombies is progressing slowly but surely, and I can’t wait for it to explode. The art on this issue, and this whole run so far, has been amazing. Gred Land, Matt Ryan and Justin Ponsor do a phenomenal job conveying emotion, particularly in the scenes where we see Ben crying. It’s not easy to make a thousand pound rock monster look vulnearble, but these guys do it. And they do the hero shots and flesh-eating zombies just as well. I’m amazed they’re able to churn out art this great on a monthly basis. 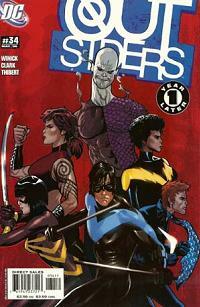 Of course, Mark Millar is the reason it all works so well. The man is one of the best comic writers today, and he really excels in titles where he doesn’t have to worry about maintaing the status quo. Unlike his Wolverine or Spider-Man runs, where he couldn’t make any lasting changes, he has pretty much free reign with the Ultimate titles, as the status quo hasn’t really even been determined yet. That makes for some pretty awesome storytelling oppurtunities, and it’s really a shame that it’s only going to last for 5 more issues. It’s DC, right? Zatanna mind-wiped Batman, Countdown to Infinite Crisis was a one-shot followed by 4 minis followed by the Infinite Crisis mini, Jason Todd returned as the Red Hood, and Identitiy Crisis saw the family members of superheroes attacked and the death of Sue Dibny, wife of the Elongated Man. But it’s also Marvel, just a little bit later. Secret War #5 featured Captain America, Spider-Man and more receiving mind-wipes from Nick Fury, Annihilation is using the Infinite Crisis formula, Bucky returned as Winter Soldier and Civil War is all about secret identities becoming not-so-secret and involves Invisible Woman dying (maybe not in Civil War itself, but in a crossover at least).